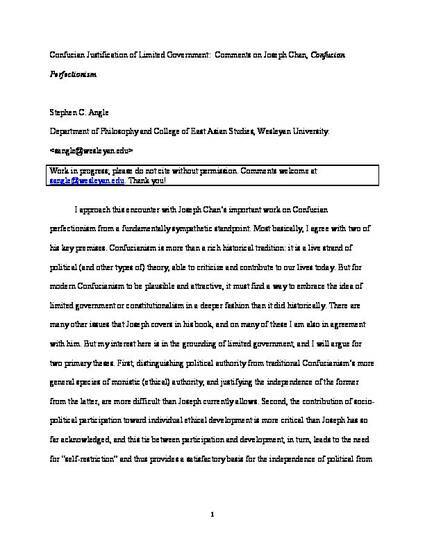 I approach this encounter with Joseph Chan’s important work on Confucian perfectionism from a fundamentally sympathetic standpoint. Most basically, I agree with two of his key premises. Confucianism is more than a rich historical tradition: it is a live strand of political (and other types of) theory, able to criticize and contribute to our lives today. But for modern Confucianism to be plausible and attractive, it must find a way to embrace the idea of limited government or constitutionalism in a deeper fashion than it did historically. There are many other issues that Joseph covers in his book, and on many of these I am also in agreement with him. But my interest here is in the grounding of limited government, and I will argue for two primary theses. First, distinguishing political authority from traditional Confucianism’s more general species of monistic (ethical) authority, and justifying the independence of the former from the latter, are more difficult than Joseph currently allows. Second, the contribution of socio- political participation toward individual ethical development is more critical than Joseph has so far acknowledged, and this tie between participation and development, in turn, leads to the need for “self-restriction” and thus provides a satisfactory basis for the independence of political from ethical authority. Joseph and I have already discussed some aspects of these issues in print, and I will build upon our previous exchange in developing my arguments here.